I'm an avid Fitbit enthusiast, I wear the bracelet BFF that gives me real-time feedback on how much I'm moving, how much I'm sleeping and my heart rate. While I enjoy the benefits of the Fitbit it's important to recognize that there can be a dark(er) side too. When I first started wearing my Fitbit it was eye-opening to see how little I was moving outside of exercise. Sure, on my running days, I'd easily rack up ten thousand steps, but on those other 3-4 days a week, I'd be lucky to hit 4000. I was working full time at a corporate job back then and I just didn't move that much outside of exercise. Based on the feedback from my new electronic friend, I started making changes. We started taking Ollie for a walk every night after dinner, I started parking in the farthest corner away from the front door at the office. I started using the bathroom on another floor at the office and drinking more water, a winning combination to get more steps. All these little changes quickly added up to my goal of ten thousand steps a day. Except for those days when they didn't. I'd panic at 9 pm when I had 8500 steps and walk in circles around my living room. Or when my best friend got married and I paced up and down the hall at the reception to reach my step goal before the clock struck midnight. Or when I'd run in place next to the bed to get those last few steps in before calling it a day, when even my dog looked at me like I was crazy. How much is too much? When does an awareness turn into an obsession? Can you take it too far? I am a participant in the Amazon Services LLC Associates Program, an affiliate advertising program designed to provide a means for website owners to earn advertising fees by advertising and linking to amazon.com. You don't know how much or how little you move unless you track, so fitness wearables can be a valuable asset in determining your movement. Maybe you don't need to see an exact number to know you're not moving enough, but for a lot of people, awareness is the first step in making improvements. What gets measured, gets managed. When you start paying attention, you can make changes in your behavior. Sleep is often an overlooked but important factor in health and weight loss. Most of your body's recovery processes happen during sleep. Poor sleep patterns can negatively affect your health. The fitness wearables can give you a better idea of how restful your sleep, It's not just about how many hours you spend in bed, but about how much quality sleep you are getting. Resting heart rate is a good indicator of fitness and recovery. When my resting heart rate is elevated, I know I need to rest, and sometimes it is a sign I am getting sick. I like to keep an eye on it because I can't always 'feel" when I need extra rest, but if my resting heart rate is up by five or more beats a minute, I know it's time to take a step back in my training or a step up in my recovery. Nothing fuels productivity like a little friendly competition. It's fun competing against your friends in the "workweek challenge" and walk away as the champion. It can be the extra motivation you need to talk a walk after dinner or go for a long hike on the weekend. Steps are great because they indicate movement, but if you are forgoing other aspects of fitness in favor of more steps, your fitness wearable could be holding you back. You don't get many steps when you are lifting weights but resistance training builds muscle, which raises your metabolism. If you skip the weights to walk even more so you can beat your online friends in a competition, then you may not be optimizing your fitness time and possibly sabotaging your results. It's a good idea to track steps, but there are other important health indicators that can be tracked like body fat percentage, body measurements, and nutrition intake. Your fitness wearable likely gives you an estimate of how many calories burned based on your movement, heart rate, and body weight, but it's just that, an estimate, and it's likely overestimated. It's great to keep an eye on how many calories you may have burned, but don't live and die by the numbers and certainly don't eat back what your wearable tells you that you burned, you may end up overeating. Eat when you're hungry and take those calories burned numbers with a grain of salt. Friendly competition is great, but comparing yourself to the steps of strangers can be discouraging. Do the best you can, make the extra effort to come out on top if you want, but in the end, you can't compare yourself to anyone else. Whether someone else gets more steps than you today or not is largely irrelevant in your own journey. Have fun with it, but don't get emotionally attached to winning at the step game. The biggest downfall of fitness wearables is relying on data from your Fitbit for feedback when prioritized over listening to your body. If your goal is to get to 10k steps but you're limping from an injury, that just doesn't make sense. If you're worn out and achy, but push through to hit some arbitrary step goal, that is irresponsible. It's great to receive the outside feedback, but always prioritize your body's internal feedback first. If your body is telling you to rest, but your FitBit is buzzing that you need 250 more steps this hour, always listen to your body over a fitness wearable. These days I almost always get ten thousand steps because I built more movement into my lifestyle, but after years of obsessing, I've learned to let it go. Will anything change in my health if I only get 8000 steps one day? Does it matter if I don't have the highest step count of all my online friends? Will the Fitbit police track me down if I don't hit my (arbitrary) goal of 10K steps? The answer is no. I do the best I can to incorporate movement into my day, but I don't beat myself up if I miss my step goal one or two days. It's another way I am learning healthy balance. You'll continue to see me share my fitness wearables on social media. If you liked this post, I explored this topic a little deeper about GPS watches in How to tell if you're in a bad relationship with your GPS watch. 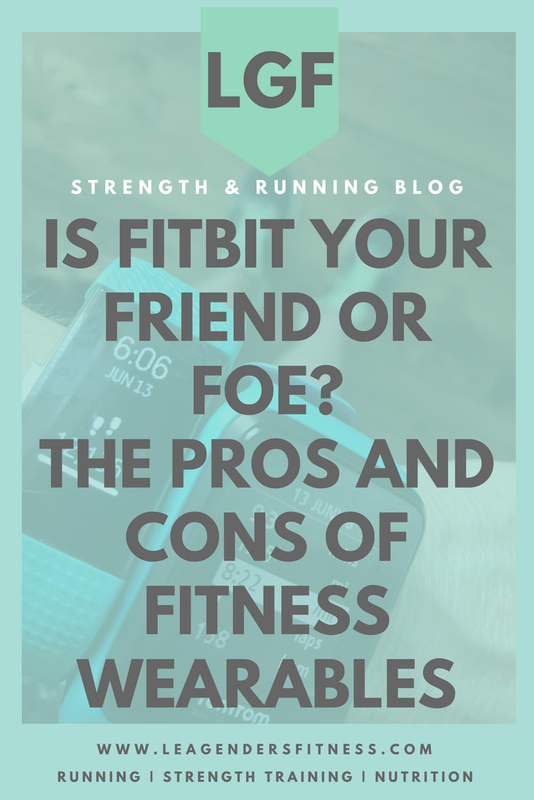 Do you wear a fitness wearable? Did you like this post? Do you know someone who may benefit from it? It helps me when you share with your friends and followers.